Breast milk purchased from Internet social media sites may contain bacteria such as salmonella, a new study shows. 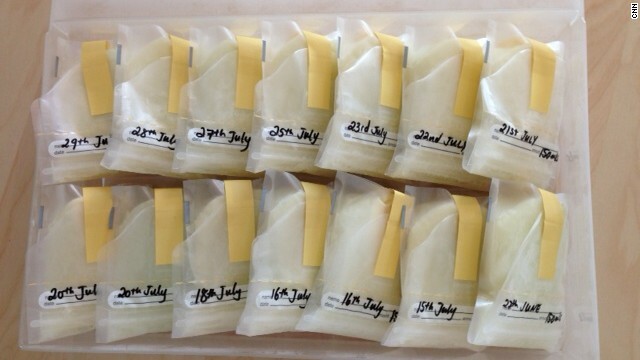 Donated breast milk is "liquid gold at our house,” says Stacy Richards, 37. The liquid gold is for Simeon, Richards' adopted 11-month-old son. He was born with Down syndrome and suffers from chronic lung disease. Richards believes "breast is best" but couldn't breastfeed, so she turned to the next best thing. Initially, she sought milk on community milk sharing sites, like “Eats on Feets,” and “Human Milk 4 Human Babies,” but didn’t feel comfortable getting milk from strangers. “We didn’t know who those women were. They didn’t have a safety net,” said Richards. Instead, she relied on trusted friends. Richards had every right to worry, according to a new study published Monday in the journal Pediatrics. The study found milk bought off of the Internet through social media sites was more than twice as likely to be contaminated with infection-causing bacteria and three times more likely to contain salmonella than milk from the Human Milk Banking Association of North America (HMBNA). While only 5% of the HMBNA milk tested positive for herpes viruses, 21% of milk from the Internet contained bacteria and viruses. HMBNA consists of 16 self-regulated, nonprofit milk banks across North America and has pre-screened donors. The milk banks further pasteurize the milk to ensure its safety. Authors of the study also found that 74% of the milk purchased from the Internet failed to meet HMBNA criteria before pasteurization. This is of particular concern for pre-term babies, said Dr. Lisa Thebner, a pediatrician in New York City. “They are more vulnerable, their immune systems are more immature, and they can’t fight off infection like full-term babies,” said Thebner, who was not associated with the study. Sarah Keim, lead author of the study and a researcher at Nationwide Children's Hospital, was surprised by the differences between the 101 samples bought over the Internet and the 20 samples from the HMBNA banks. Shipping, or "the number of days it took to get there," was a significant factor, she said. In fact, the study found that each additional shipping day resulted in increased bacteria counts. About half of the samples arrived in two days, and 19% of the shipped milk didn’t have any sort of ice pack or cooling agent. Emma Kwasnica, founder of Human Milk 4 Human Babies, said the study in itself was problematic, because most milk is donated without profit, at a local community level, and rarely is transported for several days to get to a recipient. The American Academy of Pediatrics and the FDA both recommend against using breast milk directly from a donor or the Internet, because of the safety risks. “The bottom line is, if you are going to get milk from an unknown source, you open that baggie of milk and you have to decide ... given the consequences are pretty serious, I just don’t think it’s worth the risk,” said Keim. Instead, she recommended using milk from a bank, or donating to a bank, knowing that it undergoes additional safety measures. “We recognize there’s a risk, but we felt the risk outweighed the benefits," Richards said. - If you decide to milk share, only use a source that has been screened and take whatever precautions to ensure its safety. Someone needs to fact check this: it is illegal to *buy* or *sell* breast milk. The listed websites are for donated milk only. It is completely legal, its an unregulated body product. I hope it stays legal so services like milktree can keep growing! They have been a life saver for us. Really? You would actually put breast milk, a body fluid, from an unknown person into your baby!! That is so insanely stupid I don't even know how to respond to the level of idiocy of this action. And don't comment that I am a man and can't understand. I have kids and would never, EVER, do something so foolish to risk the health and perhaps the life of my child. Use formula for God's sake. Indeed, HIV can be passed through breast-milk. I'd use formula. Eric O., did you not read the part that says who the donated breastmilk is intended for: "babies from the NICU that were unable to tolerate formula.” They can't "use formula for God's sake." Milk is species specific. Even after those babies are released from the NICU, they STILL can't digest formula and need to continue to be fed breastmilk. I feel for the families who have a gap in prescription renewals for banked breastmilk; for families whose medical insurance doesn't cover or stops coverage of prescription banked breastmilk. Mothers become aggressive grizzly bears who will fiercely protect their children. Benefit to risk: if the baby can not digest formula it will die; if the baby gets direct-donated rather than banked milk, and gets a treatable infection, it still lives. I hope they check the breast milk like they do blood from the doner, otherwise would be a disaster! Without a doubt Eric, you are going to get some haters for your comment. But speaking as a Pediatric Nurse I agree with you wholeheartedly. Although breast milk is best, the risks are too high. And Dalyce, you should do homework on what is and isn't allowed or utilized in the NICU. I work there, never is breast milk the only option for a child. And when you allow the risk of bacterial or viral infection with a preemie who cannot digest formula, the chances diminish that they will live. A viral or bacterial infection can kill them. You certainly have the right to your opinion, but medical research does not support your position. You have no idea what someone may be adding to the milk. This is just crazy to take this kind of a risk with your child. Having no proverbial dog in the fight, it's easy to read this as simply an interesting set of information. However, someone who is emotionally involved (such as a parent seeking milk for his or her infant) might miss some important points, because of how the piece is written. For example, the writer says, "While only 5% of the HMBNA milk tested positive for herpes viruses, 21% of milk from the Internet contained bacteria and viruses." A more useful comparison would be to tell the percentage of milk that tested positive for herpes viruses in the non-HMBNA sourced group, or to tell the percentage of HMBNA milk that tested positive for bacteria and viruses generally. Otherwise, you might be accused to misrepresenting your statistics. Ya, talk about an apples to oranges comparison. How dumb do you have to be to do something like this? You can barely trust government inspected facilities but you give your child milk from some person you have never met. Brilliant!!! We get blood when we need from other people's blood! You don't get blood from a random person you found online. It's donated through a blood bank, where it's screened for diseases. What a tough situation. You're trying to do the best you can for your baby, but you're putting them at huge risk as well. Unbelievable the Powers That Be should allow this at all. Meanwhile the poor farmer down the road can't even give away his goat milk for pet food. Have you seen the price of goat milk cheese? Don't tell me the farmer can't give it away. In the meantime, how many sickos will buy breast milk over the internet and turn it into "gourmet cheese". Please do some fact-checking....both Eats on Feets and HMFHB are donor peer-to-peer networks...there is no "purchasing." And donor BM is a much better alternative to formula. Unless my baby can't digest any formula (there is a wide array of formula for digestive needs), I will NEVER ever give donated breast milk to my baby. It is a bodily fluid that can contain so many things. Donor milk is only better than formula if it's clean, which it's not. "Only" 5% of donor milk had herpes in it. Great. If it's a close relative, that's one thing. But a complete stranger? Who knows what diseases she's carrying or drugs she's on when she donates? And does pasteurized breast milk have all the benefits of regular breast milk? If not, why bother unless there's some sort of exotic digestive issue? Usually it's the other way - babies have problems with breast milk but can drink the super-sensitive (and very expensive) formula. If you have no choice, then so be it, but if you do donor breast milk sounds like it's a little too dangerous. I've always been a bit creeped out by donated milk, which is why I didn't used it for my child, but I find it hilarious that they pasteurize the breast milk – thereby killing off most everything good in it! "While only 5% of the HMBNA milk tested positive for herpes viruses, 21% of milk from the Internet contained bacteria and viruses." This is an invalid comparison and extremely poorly composed article. Okay 5% of HMBNA milk had herpes. 21% of internet milk had bacteria and viruses. Well, I'd argue that ALL milk has bacteria and viruses. So which were they? are they saying 21% of internet milk had herpes? Where did they test? how many did they test? So little information inthis article except "BE AFRAID!!!! BE VERY AFRAID!!!!" Good point. And honestly, some bacteria is a GOOD thing. That's part of how breast milk helps babies' immune systems get stronger. I wouldn't drink it, you don't know if the milk is human or animal. My wife produced a lot of extra milk when she was breast feeding our daughter. We found a family about an hour away from us who wanted to continue breast feeding their son but couldn't because of a medication the mother had to take. We sold them our extra milk for over a year. The other mother spoke with my wife on the phone and asked her a bunch of questions. They would drive up to our house and pick up the frozen milk. It was very beneficial for both families. It might seem crazy to some people to buy or use milk from "a stranger" but there are plenty of ways to alleviate those fears. Stop thinking everyone on the internet is out to get you is a good start. I think that was a wonderful thing for your family to do for the other family. Kudos to all of you! Thank you Jeff! I have also donated via Hm4hb & shipped it across country. I have also donated locally. None of these babies got sick. & just so a lot of parents out there understand, herbes, hep b & c CANNOT be given to another human being via breastmilk, nor does it survive through the gut even if in the breastmilk (so, get your facts straight) . Also, I'm not seeing a lot of worried parents wondering why the FDA is pushing so hard that breastmilk us bad, especially donated, but yet it's ok to have all these chemicals (that essentially will KILL you) in processed foods. It doesn't make much sense. To add insult to injury, most of those formula companies are GMO-based (the same formula companies that are probably paying to have these "studies" done too, to push you to formula) & have bad bacteria too, with no good bacteria whatsoever. I, unthinkingly, ate chocolate ice cream early in the day. My baby girl was like a Mexican jumping bean all night long. I sat up watching her until she finally fell sleep. No way was I going to sleep, after my faux pas! I would never allow my baby to ingest a complete stranger's milk. A mother is there to protect, not infect! Now, I know you aren't referring to the caffeine from the chocolate ice cream because that would just be dumb. Did the lactose you ate cause her to be hyperactive, because I've never heard of that as a side effect. I wonder now many of those objecting to this practice are advocates for breastfeeding. This study doesn't represent how peer-to-peer milksharing networks work. Most of the sharing that happens on HM4HB and Eats on Feets happens between people in their local communities who get to know each other, screening is practiced, and sometimes processing (pasteurization) as well. This study is about purchasing milk anonymously off the Internet and arranging for it to be shipped to a PO box. it is a very important distinction. I feel for these parents. Little babies can't tolerate formula that well. My full term baby could not tolerate dairy OR soy well until he turned 3. He would have blood in his diaper. I think as a parent, one would need to worry more about what the mom eats than the bacteria issue. Breastmilk is anti bacteria, anti fungus, anti virus. If the mom drank some coffee before pumping, you'll end up with a very cranky baby.. I don't know how you can control the mother's diet. Umm I don't know what you meant by "breastmilk is anti-virus but the HIV can be transferred through breast milk. I'll try to find a formula suitable for the baby than risking his/her life. One of my three babies’ was fed with breast milk from a friend. I consulted the pediatrician and his only recommendation was to make sure my friend didn't have AIDS. I recommend using someone else’s breast milk if you need to, just make sure about the hygiene conditions. I recently donated 200 oz of breast milk to a milk bank at a local hospital and it was quite the process. After being screened over the phone, filling out a 25 page screener, and having them call my doctor, I had to get blood work done (has to be done every 3 months). They paid for UPS to come to the house to pick up my cooler of milk (which was packed/insulated) and over night to the hospital. They explained the pasteurizing process to me and the RN said that even after all of that, there are still lots of good nutrients in the milk that babies need, especially preemies and regardless, it’s still a lot easier on their tummies compared to formula. We’re talking babies born at 25 or so weeks who are extremely susceptible to NEC and other infections where introducing formula would just be dangerous. Also, Bob C. – “Usually it's the other way – babies have problems with breast milk but can drink the super-sensitive (and very expensive) formula” REALLY? No. Breast milk is perfectly formulated for babies and their digestive system. You make it sound like it’s a common occurrence that babies reject breast milk and have an easier time with formula. A lot of moms have to try several different formulas before they find the right one that their baby can tolerate. There is a huge error in this article.It says "While only 5% of the HMBNA milk tested positive for herpes viruses, 21% of milk from the Internet contained bacteria and viruses." Herpes can not be transmitted through breast milk,only sexual contact. Uh, no. Herpes is easily spread through saliva – and, presumably, by having infected milk in your mouth. I donated 250oz a few months ago to a girl I used to know in high school. Through FB I found out she wasn't making enough for her one month old twins with tongue/lip ties, so I contacted her and offered my extra milk (including colostrum). I don't know that I would be comfortable taking milk from a complete stranger, but I can see how the option would be better than an unnaturally processed formula for some families. I received some free formula samples before my daughter was born from the formula companies and the first three ingredients included "modified corn syrup solids" which doesn't sound like a great thing to give a baby to me. The mothers were extremely grateful for our generosity and we were happy to help them out. Of course, the donation is a risk (on both sides, really), and we understood that (and so did the mothers), but luckily for our "mother's" we are honest and we really maintained the integrity of our milk. If my wife had a drink of beer or something like that, the milk was discarded, and we don't do drugs, have AIDS, or any other diseases. We signed a release and they signed one too (because we didn't want to be responsible if they didn't freeze the milk right away). We met some wonderful mothers, fathers, and kids through this process and we'd do it again in a heartbeat if it meant we could help a baby (and mother) in need. There are SO many reasons for why a mother can't breastfeed. How awesome that both you and your wife donate breastmilk. It's rare to find a man who is willing to lactate to help babies in need. Leah, you win the internet today. Giant yuck factor, but what an opportunity to make a fast buck in a completely unregulated market. A box of Carnation powdered milk, some tap water, and...pure mail order gold! Seriously, who on earth thinks this is a good idea? They are good studies showing premmies fed formula for 1 year have 10 point lower IQ at 8 years of age than breast milk fed babies. Formula fed premmies also get many complications during the acute phase of their first months of life that may lead to death than breast fed babies. I don't know anyone who knows the cow who produced the formula a baby drank. The FDA recommends not giving premmies powdered formula as it has killed some in the USA. May the research should focus on the best way to package and ship breast milk for human babies. We don't give cow blood to humans why milk. I have never the study testing formula to even be safe to give to humans where are those clinical trials? This article fails to mention how expensive the legit donated breast milk is. While the mothers might not get paid for it (just as blood donors aren't), the collection, processing, and distribution costs money. My understanding is feeding a baby with that would be over $100 per day. Not an option for most people whose insurance won't cover it. This article was very poorly written. I actively used HM4HB and Eats on Feets to obtain milk. Those websites do not sell milk. It is donation based on the kind-heartedness of Moms who have extra to spare. You can have donor moms get tested for diseases (to be honest they do that testing standard prenatally but that is beside the point). I would love to see how they got the "research" on the increase of viruses in donor milk. Seems like shoddy research at best. I am currently pregnant & I would donate to both HM4HB and Eats on Feets, but I would not donate to a hospital. Mainly because I can get my milk to babies who need it & they do not have to pay a dime. If I gave it to a hospital they charge the family/insurance an arm and a leg for it. Oh and the baby that received the donor milk was a micro-premie who received the milk after being discharged from the hospital. This child never got sick & her tummy issues disappeared almost immediately! It is amazing the difference between breast milk & formula. I think if people really studied what formula was made out of (high fructose genetically modified corn syrup to start), they would be appalled! As a milk donor I agree with you. I get to know people before I donate the milk and I offer all my medical records stating that I'm healthy. Breast milk increases a child's IQ more and more for each month it is given as well as immunity and other benefits. The people I've donated to have all adopted their children. After all the effort made to adopt a child, why shouldn't they go the extra mile to provide the baby the best? Also, this is a new fear. Wet nurses and women feeding other peoples babies was the norm in times of need for the bulk of human history. Why have we become so squimish and weak? To the last poster, go back and reread the ingredients on formula before you make your absurd claims. People think breast milk and raw milk are miracle cures. Breast milk is very beneficial for an infant or toddler. Neither will do an older child or grown adult any good. I don't care what your chiroquack told you. He's a lying scam artist, and you're the fool believing him. Formula is pasteurized milk "donated" from a cow. Oh, and on several occasions contaminated formula has killed babies! Both the WHO and UNICEF consider breast milk from another mother to be the next best option if a mother is unable to breastfeed! My mother-in-law was raised in Europe (Austria and Czechoslavakia) during the early part of the 20th century. She says it was not uncommon for wealthy families to hire "nurse-maids" to breastfeed their babies for the first year or two. She says she had a nurse-maid and her older sister had a different one. In other cultures, women in a community will breastfeed babies and toddlers that are not their own, especially if the mother is sick or working. This is probably a silly question, but why would anyone (anyone with a brain that is) buy Breast Milk on-line? I trust on-line sources enough to buy underwear, or batteries, but food for a newborn . . . , IDFTS!!! Breast milk online are you kidding. I PREFER TO GET MINE FROM THE SOURCE, LOL!! It wasn't only in other countries that nursemaids were used. In the days of US slavery, that's one reason those women were kept raising the kids in the "big house." Not only did they nanny for them, but they breastfed them, too. It is only our shortsighted, ignorant & brainwashed citizenry that take exception to this VERY NORMAL & healthy alternative to chemically made and enhanced (but NEVER quite able to meet the perfection of breastmilk). How messed up we must be to think a natural liquid made SPECIFICALLY for human babies would be subpar to something made to duplicate it. Duh. I've been getting milk for my little guy from MilkTree for the past 3 months and it has been awesome. They screen and test the milk for tampering that moms share with them. I absolutely love it. It is costing us about $300 / mo. but we would pay twice that if we had to. Love it!